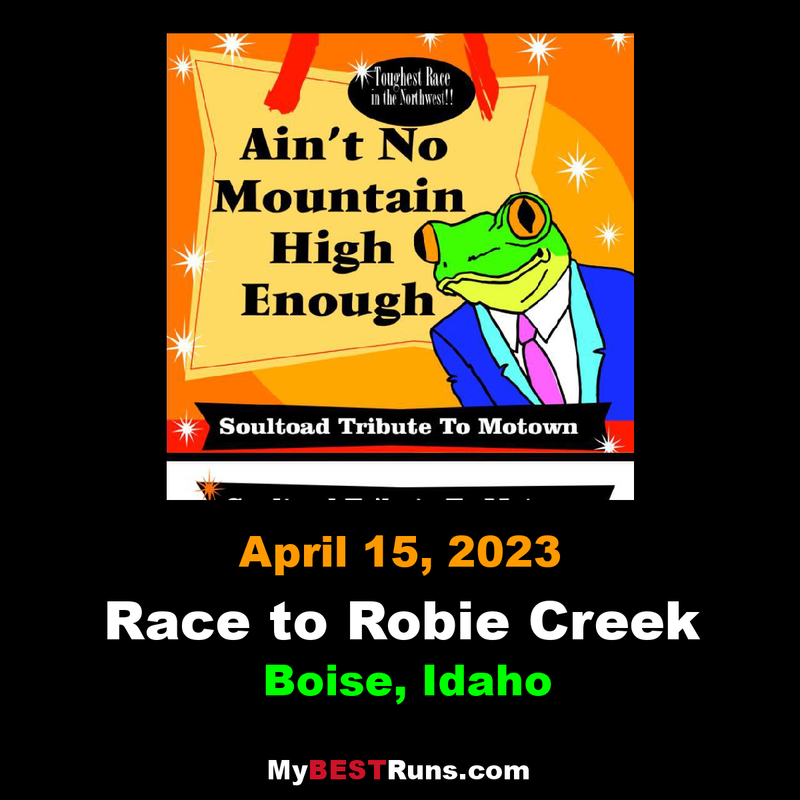 The Race to Robie Creek is held the third Saturday each April, starts at High Noon. 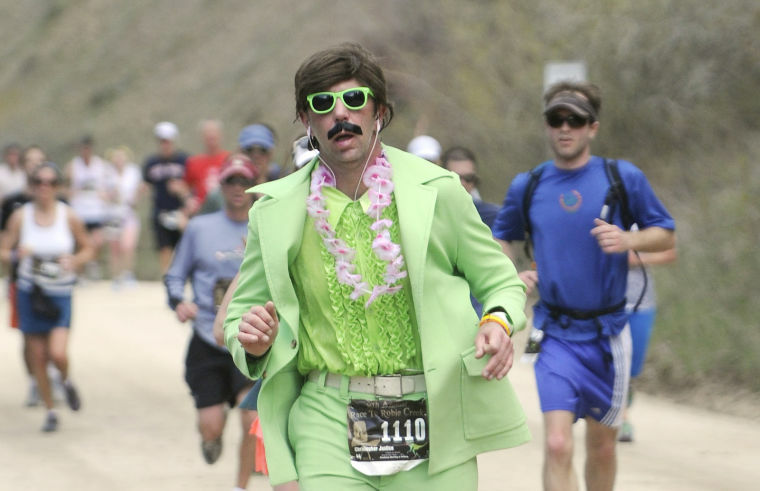 With the help of generous sponsors, hundreds of volunteers, and to the benefit of numerous local charities, we always offer a fun, slightly irreverent, top quality, half-marathon race. With an amazing post-race party and entertainment. It was 5:00 pm on August 18, 1975, that Boisean Jon Robertson invited 24 friends on a hot August nights run. 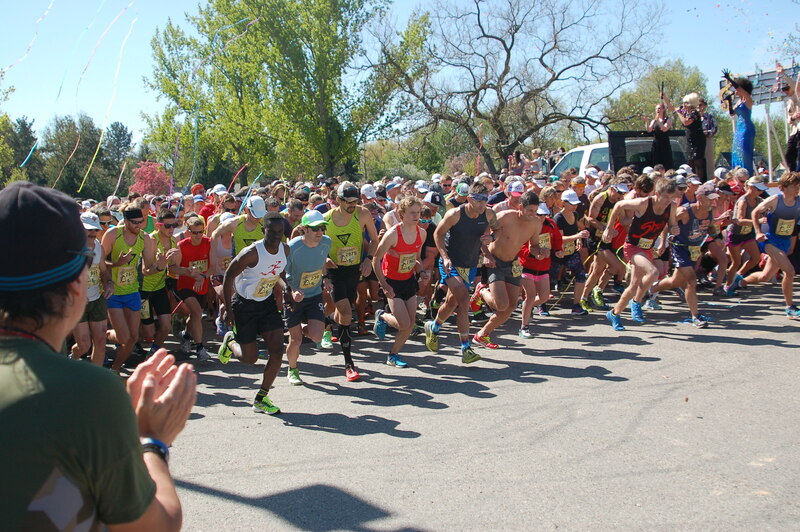 The start would be at Fort Boise (elevation 2,725 ft), 8.5 miles up Rocky Canyon and over Aldape Summit (elevation 4,797 ft), to a 13.1 mile finish at Robie Creek campground (elevation 3,065 ft). Such was the birth of the Rocky Canyon Sailtoads and the Race to Robie Creek. This is a tough by fun half marathon. Some know it as the long climb to Aldape Summit. Others see it as a “rite of spring” that arrives each year in the Boise foothills. It has been proclaimed “The Toughest Race in the Northwest. But no matter what label you put on it, the annual Race to Robie Creek® is a challenge to all who dare to participate. It was 6:30 pm on August 16, 1975, that Boisean Jon Robertson and 24 other participants competed in what was called the first “Idaho Summer Road Racing Championships”. 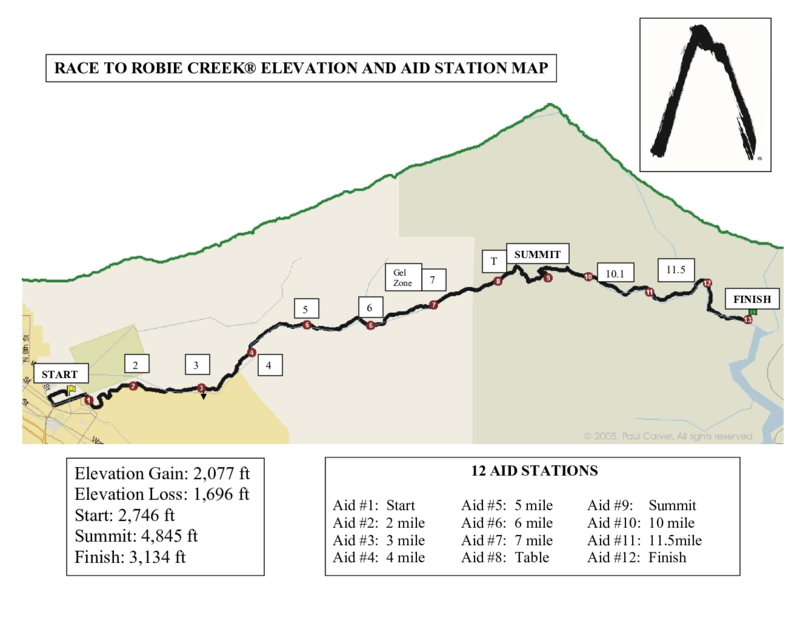 The start would be at Fort Boise (elevation 2725’), up Reserve Street and Shaw Mountain Road, and then climbing the long and winding road up through Rocky Canyon and over Aldape Summit (elevation 4797’), to a 13.1 mile finish at Robie Creek campground at Lucky Peak Reservoir (elevation 3065’) — combining a half-marathon distance with a 2072 foot ascent, and a 1732 foot descent. Such was the rather quiet birth of the Rocky Canyon Sailtoads and the Race to Robie Creek®. That inaugural event drew little media attention back in 1975 — the Idaho Statesman reported in two sentences that Don Flaten from Boise won the race covering the course in 1 hour, 20 minutes, and that the women’s winner was Cindy Partridge of Moscow in 2 hours, 2 minutes. It was reported that “Flaten, from Boise, caught open division winner Glen Lorenson at the top of Aldape Summit and cruised the rest of the way to victory.” Mark Tappan of Buhl, Idaho, was the high school division winner; Gus Meyers, of Boise, won the 30-40 division; and, Tom Tappan, of Buhl, Idaho, won the 40-50 division. That second race, sponsored by the Nautilus Fitness Center and Chase’s Place Natural Foods Restaurant, produced the first commemorative T-shirt labeling Robie as “The Toughest Race in the Northwest” — a resurrection of the original ordeal that, like the swallows to Capistrano, has now become an annual rite of spring on the third Saturday in April in the Boise area for thousands of runners and walkers alike. One hundred and seventy-one runners participated in that second race where the men’s winner, John Chase, from Soda Springs, shaved more than two minutes off the original course time to finish in 1 hour, 17 minutes and 52 seconds. The women’s winner, Bishop Kelly junior Ellen Lyons, finished in 1 hour, 26 minutes and 32 seconds — only hours after she had run the second-fastest mile and two-mile in state school history at an invitational meet in Caldwell.